Remember, early planning puts time on your side. Whether retirement is around the corner or decades away, there are more options than ever to help you plan for it. Let’s look at Individual Retirement Accounts (IRAs) and 401(k) plans, which offer tax benefits that can help you save for your future. If you are age 50 or older, you can make additional “catch-up” contributions of up to $1,000. Earnings have the potential for tax-deferred growth, and contributions may be tax deductible, depending on your income and participation in an employer- sponsored retirement plan. Because IRAs are intended to help you save for retirement, rules govern when you can begin accessing funds. Distributions before the age of 59 ½ may be subject to a 10% Federal income tax penalty, in addition to the income tax that will be due. However, there are exceptions to the 10% penalty, such as withdrawals to pay for qualified higher education expenses or to fund up to $10,000 of your first home. Roth IRAs operate differently from traditional IRAs. Contributions are not tax deductible, but earnings have the potential for tax-deferred growth and qualified distributions are tax free. $120,000 and $135,000, and for joint filers with modified AGIs between $189,000 and $199,000). As with traditional IRAs, a 10% Federal income tax penalty may apply to distributions taken from your Roth IRA before the age of 59 ½, unless a qualified exception applies. Furthermore, before tax-free distributions can be received from a Roth IRA, the account must be five years old. You also may convert an existing traditional IRA to a Roth IRA. The distribution from your traditional IRA will be taxed in the year of conversion, but you won’t be penalized for the early withdrawal, provided you keep the converted funds in the Roth IRA for at least five years. The 401(k) is a retirement plan offered by thousands of employers to facilitate retirement savings for their employees. As a participating employee, you can contribute the lesser of $18,500 in 2018 or a percentage of salary as defined by the plan. $6,000. In some cases, your employer may match your contributions up to a certain percentage. This increases your principal at no cost to you. Contributions to a 401(k) are pre-tax, which means you don’t pay taxes until you withdraw money from the plan. This may be attractive for those who expect to be in a lower tax bracket during retirement than during their working years. In addition, your contributions have the potential to grow on a tax- deferred basis. As with IRAs, nonqualified withdrawals from a 401(k) before the age of 59 ½ are subject to a 10% Federal income tax penalty, unless a qualified exception applies. 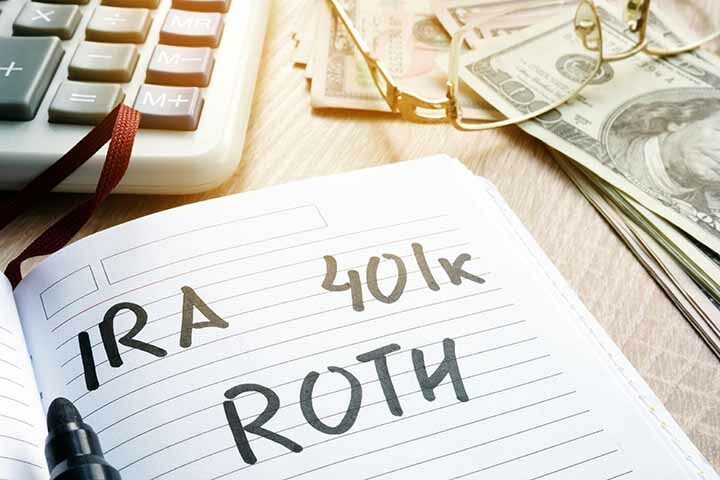 Some employers may also offer a Roth 401(k) option, which allows workers to make Roth IRA-type contributions to their 401(k) plan without the income restrictions and lower contribution limits that apply to Roth IRAs. The contribution limits are the same as for traditional 401(k)s, but salary deferrals to Roth 401(k)s are not tax deductible. Qualified distributions are tax free. Under the Small Business Jobs Act of 2010, participants in 401(k) plans are now permitted to roll over funds into Roth accounts within their plans. Any eligible funds transferred from traditional to Roth 401(k) accounts are taxed in the year of conversion. It is also important to keep in mind that any employer matching contributions must be made to the traditional side of a 401(k) account, not a Roth. These are just some of the retirement savings options available. Remember, early planning puts time on your side.